A word occurring in connection with "Siccuth" in Amos v. 26. Scholars have long been puzzled to know whether in this passage they are common nouns or proper names. "Siccuth" is probably the Assyrian "Sakkut" (Schrader, "K. A. T." pp. 442 et seq. ), an epithet of Ninib and Anu. Ninib was identified with Saturn (Jensen, "Kosmologie," p. 136), the Assyrian name of which was "Kaiman" ("Kaiwan"). 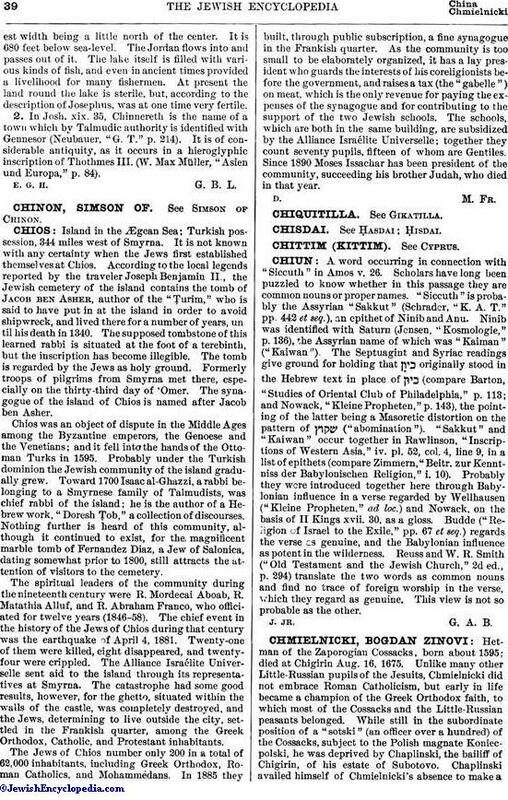 The Septuagint and Syriac readings give ground for holding that originally stood in the Hebrew text in place of (compare Barton, "Studies of Oriental Club of Philadelphia," p. 113; and Nowack, "Kleine Propheten," p. 143), the pointing of the latter being a Masoretic distortion on the pattern of ("abomination"). "Sakkut" and "Kaiwan" occur together in Rawlinson, "Inscriptions of Western Asia," iv. pl. 52, col. 4, line 9, in a list of epithets (compare Zimmern, "Beitr. zur Kenntniss der Babylonischen Religion," i. 10). Probably they were introduced together here through Babylonian influence in a verse regarded by Wellhausen ("Kleine Propheten," ad loc.) and Nowack, on the basis of II Kings xvii. 30, as a gloss. Budde ("Religion of Israel to the Exile," pp. 67 et seq.) regards the verse as genuine, and the Babylonian influence as potent in the wilderness. Reuss and W. R. Smith ("Old Testament and the Jewish Church," 2d ed., p. 294) translate the two words as common nouns and find no trace of foreign worship in the verse, which they regard as genuine. This view is not so probable as the other.